Russian scientists launched an ambitious record-setting 520-day Mars spaceflight simulation on June 3, a milestone in mankind’s ongoing journey to reach the Red Planet. It’s a scene that looks like a lift from a Hollywood science fantasy. But it’s for real. On June 3, a multi-national crew, comprising three Russians, two Europeans and one Chinese volunteer, lodged themselves inside their windowless cabins for a simulation flight to Mars for 520 days. They will remain on Earth in Mars-like conditions for nearly 18 months, isolated from the rest of mankind with only each other for company. The astronauts will not be able to leave the capsule before the end of November 2011 – the hatch only opens from the outside. The experimental space module, installed in one of the buildings of RAN’s Institute of Medical and Biological Problems (IMBP), is now a hive of frenetic activity. Medics are busily scurrying to and fro, engineers are testing life-support systems, computer experts are tapping away at monitors. “Choosing a team for the project was no easy task,” says the technical leader of the “Mars500” project, Evgeny Demin, from the IMBP. Out of hundreds of applicants, the institute zeroed in on only the healthiest men, who showed psychological compatibility under extreme conditions; the future astronauts spent the winter in icy conditions in a forest on the outskirts of Moscow - they lit fires, built cabins and lived on tinned food. 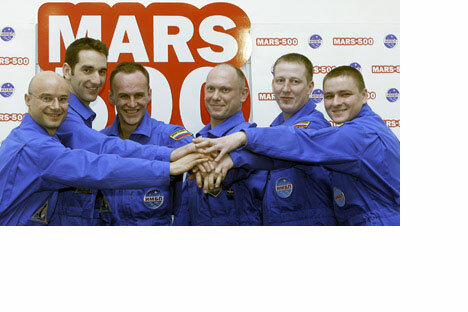 After rigorous tests, Aleksei Sitev, a 38-year-old engineer, was chosen as the commander of the Mars vessel. The 37-year-old surgeon Sukhrob Komolov and the 32-year-old Aleksandr Smoleyevsky made the cut for on-board doctors. The Chinese space researcher Wang Yu, 27, Italian engineer Diego Urbina, 27 and French engineer Roman Charles, 31, are a part of the team, imparting a trans-national dimension to the conquest of the Red Planet. The audacious Mars500 project, a joint experiment by Russia, the European Space Agency and China, will be undertaken over the next eighteen months in a simulator, which is made up of five modules. “The first module has a volume of 100 cubic metres and is intended as the crew’s quarters. It has six individual cabins, a common room for relaxing, a kitchen, a lavatory and the main control panel,” says Demin. The second module is the medical centre. All 105 experiments planned for the “flight” will be carried out here. The third module is a storage compartment comprising a gym and a greenhouse, where radishes, tomatoes, lettuce and onions will be grown. The fourth module mimics the capsule lowered onto the surface of Mars and the fifth module is an “Imitation of the Surface of Mars” where the astronauts have to disembark in special spacesuits. For all the detailed recreation of a real Mars flight, the simulator still bears little resemblance to a real space ship: its interior is panelled in wood and there are calendars and photographs on the walls. Ordinary sand from the seaside has been used to conjure up the Martian terrain and dark blue LED lamps replicate a starry sky. But in the end, it’s not the form, but the content matters. "Goodbye Sun, goodbye Earth, we are leaving for Mars!" wrote the French engineer in a mission diary. The everyday life on the “flight” will be split into eight hours of work, with the rest of the time split into leisure and sleep. The day starts at 8 in the morning, then there is a medical check-up, followed by work on the scientific programme, lunch, a short break, another round of scientific work, two hours free time, supper and sleep. They will get their share of privacy, albeit under the gaze of around 70 video cameras which will be following the progress of the researchers. Images of their activities will be transferred in real time to the mission control, where they will be monitored 24 hours a day by two doctors and a team of engineers. For the sake of realism, there will be a simulated delay in the signal connection. This will get longer as the Mars ship supposedly becomes more distant from the earth. Rest assured – we’ll get there! Will the human body be able to cope with such a prolonged and testing flight? Suvorov is certain it will. “We must remember Valery Polyakov’s flight into space which lasted 437 days. Therefore, 520 days is not the limit.” “Be rest assured – we’ll get there,” says a confident Aleksei Sitev, the team commander. “The time will come when we will really reach Mars,” he says prophetically. Russia’s Mars dream harks back to the sixties. The first simulations of long space flights started at the IMBP around this time. The first experiment was a simulation of a year’s flight, aimed at evaluating the workability of life-support systems in 1967. “The first Mars spacecraft consisted of only two modules,” recalls Professor Boris Adamovich, the former chief constructor at the institute and a doctor of technical science. Three men lived in a space the size of a sleeping compartment in a railway carriage. Their only link to “Earth” was a radio connection. Once a month, an astronaut-doctor was allowed to open the blind on the window to speak with a supervisor on Earth. The supervisor was a young woman. And the astronaut doctor fell in love with her. They spent hours in conversation. But there were also psychological difficulties. Every week, the on-board technician had a nervous attack. At night, he jumped out of bed and demanded to be let out. “The mission’s chief medic and myself spent the whole night trying to persuade him to stay,” remembers Adamovich. In the end, it was not a thirst for making history, but the lure of owning a Volga car, promised to every participant in the experiment, won him over.